With a focus on the very best street food and a shop specialising in the artisanal, regional ingredients, Mercato Metropolitano is set to become the place to be for foodies across the capital. Tom Shingler went along to the opening night to see what’s in store for visitors. One thing’s for certain: Andrea Rasca, the man behind Italian market Mercato Metropolitano, doesn’t do things by halves. His recently opened 45,000 square foot site is home to a bakery, fishmongers, butchery, coffee roasters, artisan supermarket, pizza oven, pasta makers, cheesemongers and kitchen garden. And that’s even before getting to the street food side of things. The London Mercato aims to bring the same quality food and drink over from Italy – many of the chefs and servers have come over from Italy to share their passion for the country’s produce. Proper Neapolitan pizza, fresh, handmade pasta and mozzarella made in front of your eyes certainly offers something many other markets can’t. But Andrea wants the market to be about much more than getting something good to eat – he’s trying to create a social hub for the local community. ‘I believe you should be sitting at a table with your friends when you eat,’ he says. ‘It’s an Italian tradition. You can’t really talk when you’re standing up with food in your hands, but when you sit down you start to see things in a clearer way.’ The market certainly has plenty of seating, which sets it apart from many other street food set-ups, and people can choose whatever they want from the many stalls before sitting down to eat together. There’s also an on-site gym, a barber shop and a co-working space, as well as an immersive film experience from Backyard Cinema. This, combined with the regular workshops, classes, performances and planned cookery school, means there’s much more to do than just eat at the market. Next to the street food stalls, bars and artisans is Mercato Metropolitano’s own supermarket, Prezzemolo e Vitale, which specialises in Southern Italian produce. The cheese counter alone is worth visiting, showcasing a variety of Italian cheeses all but unheard of in the UK, but there’s also plenty of charcuterie, fresh produce (including incredible huge Cipolle di Giarrantana onions, perfect for roasting whole in the oven), breads, wines and beers. Andrea has plans to host classes at the cookery school which will show people how to make the most of all these niche and seasonal Italian ingredients. While the market has a strong emphasis on Italian food, Andrea is keen to include local businesses in any way he can. ‘I believe local produce is so important, so I want British and international food to be on offer as well,’ he says. If it is good quality and fits in with what we want the market to be about, then it’s a perfect match.’ Indeed, the likes of Canteen already have a stall there, and other vendors are serving up fantastic dishes from Spain, Argentina and Vietnam. It’s this inclusive, local, welcoming attitude that makes Mercato Metropolitano well worth a visit. But if you’re only going to try one of the many dishes on offer, the wood-fired pizza is a must. 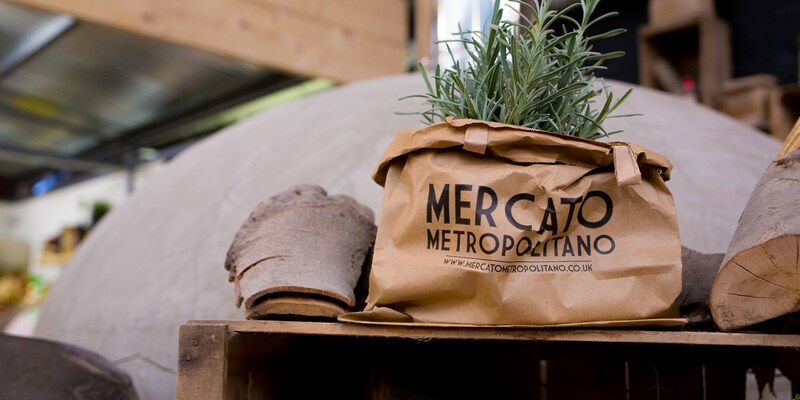 To find out more about Mercato Metropolitano, visit the website or follow them on Twitter.